The treats train has not slowed down since Halloween and we still have a month to go until we all resolve to stop eating like there's a food shortage coming. But thankfully, we can feel full of holiday spirit, and not junk with these chocolate-covered banana reindeer. I tried this with a few different types of fruit, and bananas worked better than apples, strawberries, or grapes. These treats are also easy to make allergen friendly. Melted carob worked just as well as regular milk, dark, and white chocolates. I used spelt pretzels because this ancient grain is easier to digest than regular wheat and the Happy Herbert brand's ingredient list is blissfully straightforward. However, there are many types of gluten-free pretzels out there that would make a good substitution. The coconut oil that thins out the chocolate also makes these frozen pops a little tropical, which reminds me that there are warmer days ahead. Eventually. Cut each banana into thick slices (you should get about 6-7 slices from each large banana). 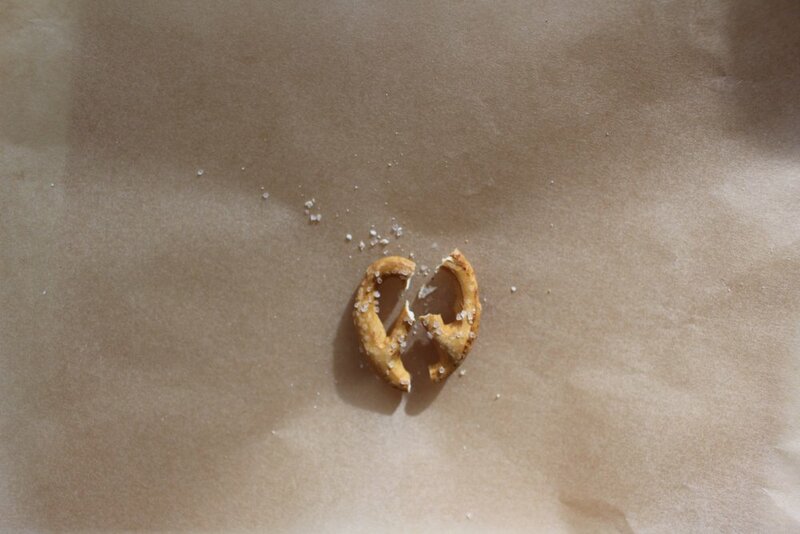 Snap 12-14 pretzels in half and remove the middle nubbin. Stick the ends of each pretzel into the sides of the banana pieces to make antlers. Stick a wooden popsicle stick into the bottom of the banana slice. Place all bananas with antlers and sticks onto a parchment-lined baking sheet and freeze for at least one hour, but up to one day. Once the bananas are frozen, combine ½ bag of your preferred chocolate with 2 Tbsp unmelted coconut oil in a large bowl and melt in the microwave. Cook for 30 seconds on high and then in 10 second bursts until liquid, stirring between each burst. Let cool for 10 minutes. Remove the bananas from the freezer one by one and dip in the melted chocolate. Tap off the excess and, using a small plate, transfer back to the baking sheet in the freezer and repeat with the other frozen bananas. Let the covered bananas freeze for at least one hour, but up to five days before serving.